Instead of immediately calling upon a major national company to handle a plumbing problem, consider supporting a local business by choosing to call a local Bedford, TX plumbing company, like HEB Plumbing & Sprinkler. At HEB Plumbing and Sprinkler, we handle all types of plumbing repairs for your home or business. If you are renting or own a home/business, you will need some plumbing services every now and then. Problems can emerge and suddenly you might need help with your water heater, toilet, garbage disposal, a leaky faucet, leaking pipes, and the list goes on and on. When you are having plumbing problems the best thing to do is find a plumber to help with your plumbing situation. Plumbers provide installation, repair, maintenance, and even consultancy services. For example, they can remove tree roots that grow within the sewage systems causing toilet backups. Or they can do preventative inspections to make sure you’re on top of your plumbing system. 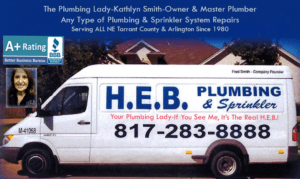 For several decades, HEB Plumbing & Sprinkler has provided honest, reliable, professional plumbing services to residents and business owners located throughout Bedford, TX. We were founded in 1980 by Master Plumbers Fed and Kathlyn Smith. It has been over 35 years and we continue to provide exceptional plumbing services to Bedford, TX and surrounding cities. When clients call us for help with their plumbing, they know they are not only getting an experienced plumber, but they are getting the work done at a price that is honest and fair. This is something we have done since the first day we were founded. In addition to the years of experience, clients who call upon HEB Plumbing & Sprinkler know they are getting professional plumbers. All of our plumbers are licensed and bonded, which reassures our clients that they are trusting the right people with their current plumbing project. The type of plumber you need will vary depending on the type of problem you experience. Instead of having to call several different plumbers to see if they offer a specific plumbing service, you can call HEB Plumbing & Sprinkler. 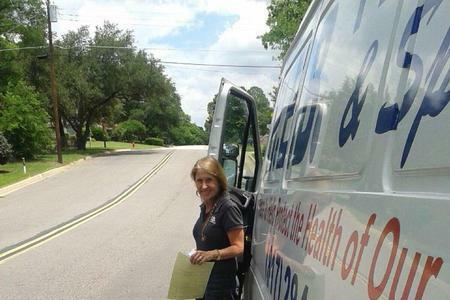 HEB Plumbing & Sprinkler offers a comprehensive selection of plumbing services. Our plumbers are capable of handling everything from unclogging blocked pipes caused by tree roots to water heater repair or installation. In fact, no job or project is too big or too small for us to handle. Locate and repair leaks on gas, water, and sewer lines, as well as under slab foundations, in attics, under pier/beam houses, and in yards. If you live or own a business in Bedford, TX and are in need of plumbing, call HEB Plumbing & Sprinkler. We are here to help! They were on time. Polite. Fast. And fixed the problem. I’m not sure what else i could ask for. We had a plumbing issue as soon as we moved into our new home. We read the google reviews and decided to give Kathy's service a try. Kathy was great with communication and followed up before the arrival time. Eric came to the house promptly and did a awesome & effective job with our plumbing issue, cleaned up and gave good advise as well. The rates were very affordable. I would recoomend them strongly! The ratings are true! Kathy and her team deserve a 10 star! Nick came out and did the dirty work.Kathlyn followed up with quality assurance.Great team! Thank you Bill for your 5 star review. It is greatly appreciated. Nick was kind and quick and informative. I will definitely recommend nick and HEB plumbing. Great service!